It was back in 2010 when a group of friends, partly inspired by a love of bands like The American Dollar and Mogwai, decided to pool their talents and come up with their own band. Despite their individual hometowns "spanning the length of the United Kingdom", which could (and most likely did) easily create all sorts of problems, the guys in Civil Protection honed their skills over the course of some early demo releases before signing on with Bunnysnot Records to release their full-length debut album. With "Stolen Fire" the group, vocalist/guitarist Adam Fielding, guitarists Nathan Bradley & Josh Clark, bassist Philip Birch and drummer Kenny Skey, has pushed themselves hard in order to create a debut-album that demands to be noticed! 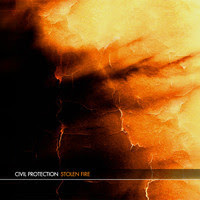 Their music is is boldly post-rock and it's clear to see that Civil Protection is certainly not shy when it comes to tinkering with that sound while in the studio! After working with Active Audio studios the result speaks for itself. Here is a group that, having grown from it's humble beginnings, has branched out musically. Seeing as their full-length debut album offers fresh and original material that is both treasured and tragic it's not that far-fetched to suggest that "Stolen Fire" will make it's way onto one of more year end "Best-Of" lists! Even though they were born from the shared love of The American Dollar and Mogwai and had their sound further nurtured thanks to support shows with Vasa and The Indelicates (both of which were/are like-minded acts) the group found their own pathway. Granted, that pathway was once paved by the likes of This Will Destroy You, Godspeed You! Black Emperor, Caspian, If These Trees Could Talk, Maybeshewill, Tool, Nine Inch Nails, Pixies, Smashing Pumpkins and Pink Floyd, but here on "Stolen Fire" things do come together in a rather splendid kind of way. "Stolen Fire" sees a band that can move between (and sometimes even converge the two extremes) these beautiful passages and haunting melodies while making it all seem so natural! Such a talent should never be taken for granted so when this album sees it's release later on in October it should be rapidly picked up and devoured by any/all post-rock fans. As for everyone else? That just depends on how flexible you are when it comes to your personal tastes in music. Of course that can just about be said about any album posted here right? For every album that gets covered here on HMTM there is likely someone somewhere who thinks it is all a bit "off ". Given all of that, an album like this (where words like "ambient" and "experimental" could be thrown around) might not be "everything for everyone", but for those who crave life with a little bit of "spice" added in then this album, which I really just outright dug, should be on their radar.